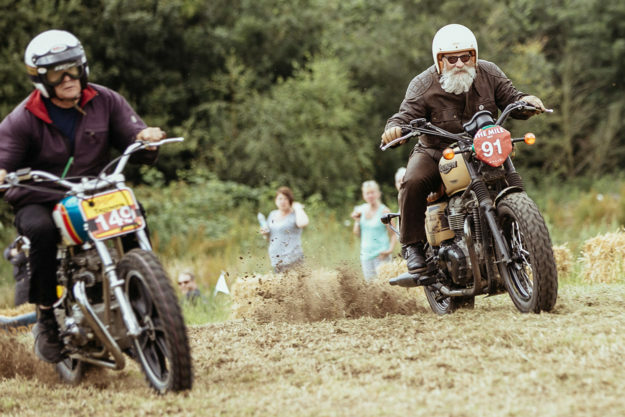 In Europe, barely a weekend goes by without some form of motorcycle racing. 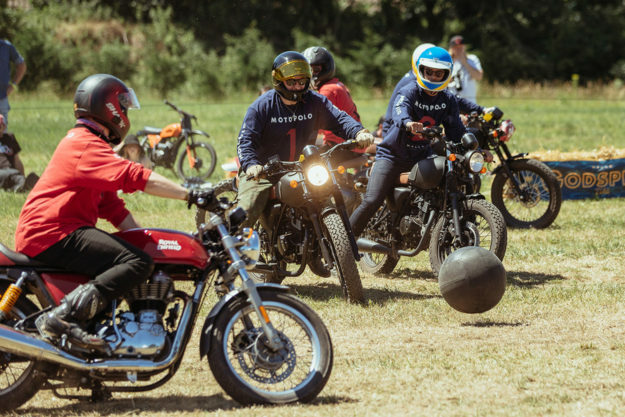 If you want to test yourself and your bike, you can choose from flat track or drag racing, enter a build-off competition, or join a custom-oriented ride-out. 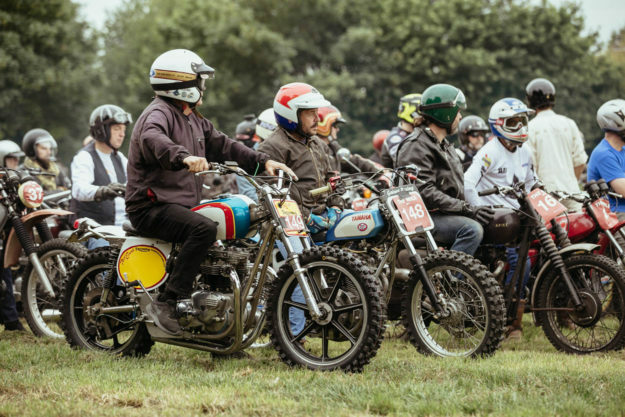 Over the past few years, the limelight has been stolen by Wheels & Waves, DirtQuake and Glemseck. But what if you live in the UK, and want to sate your thirst for an adrenalin kick or entertainment fix? 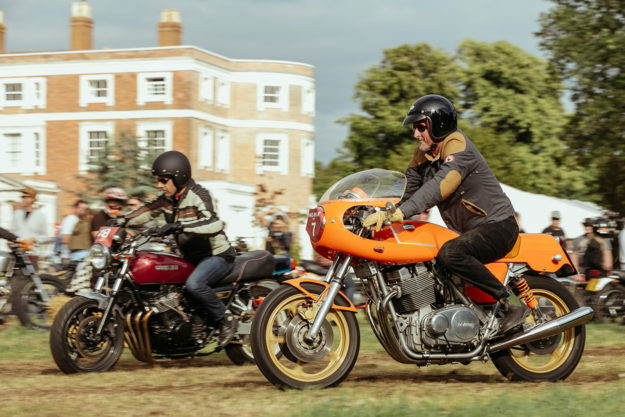 The two young gents behind the motorcycle luggage brand Malle London, Robert Nightingale and Johnny Cazzola, spotted a niche—and a gap in the calendar. 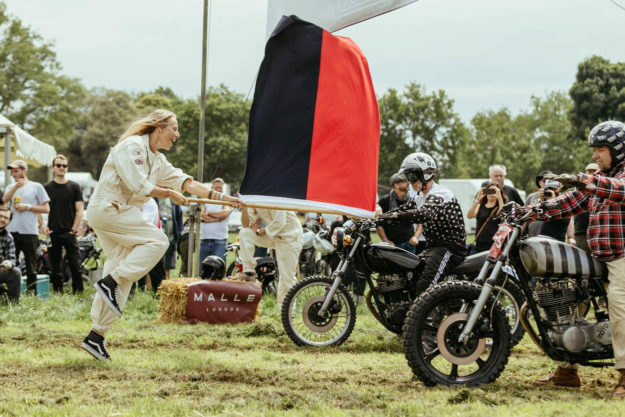 Three years ago, they decided to put on a quintessentially British moto-inspired garden party, and The Malle Mile was born. 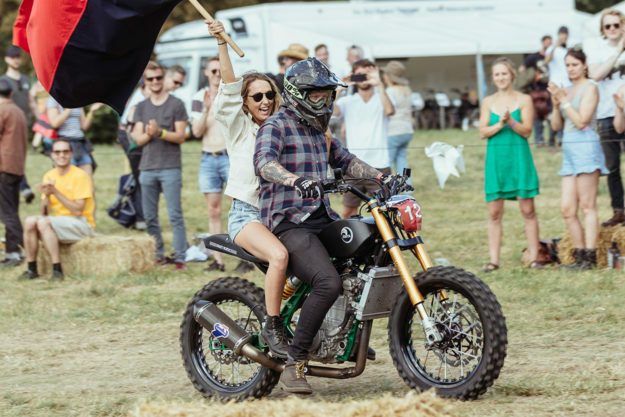 Judging by Instagram feeds these days, people all over the world are making the most of their motorcycles, every waking hour. So why does the scene need a plummy shindig at some salmon-trousered chap’s stately home in the countryside? Well, it’s simple—participation. Sure, you can do track days, or join an amateur race series. But that all comes with added seriousness, and the effort/cost-to-fun ratio quickly falls out of balance. 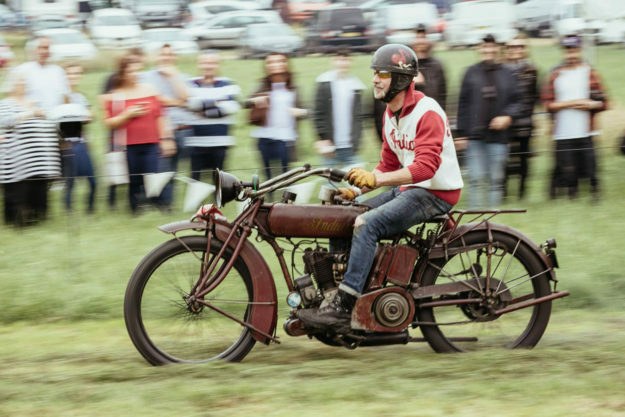 The Mile is a chance to ride to an event and watch a select few have a laugh. 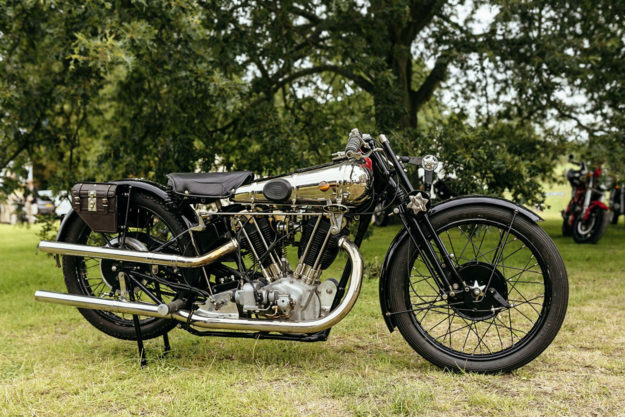 You stick a number on your headlight and let rip, head-to-head, against your mates. The winner is the one with the biggest smile, or the tallest tale of near-glory. 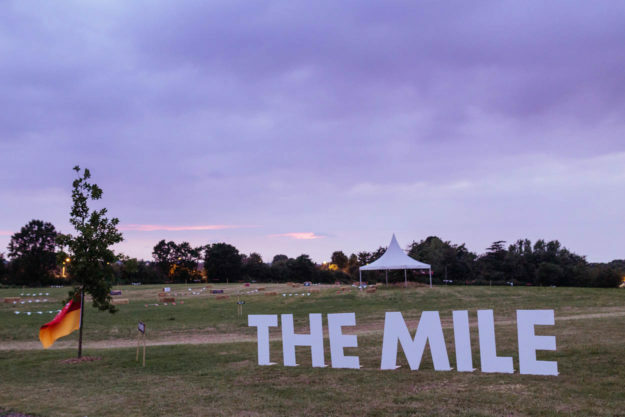 Three years ago, just a few hundred folk pitched up at Kevington Hall (just south of London in Orpington) for the first edition of The Mile. 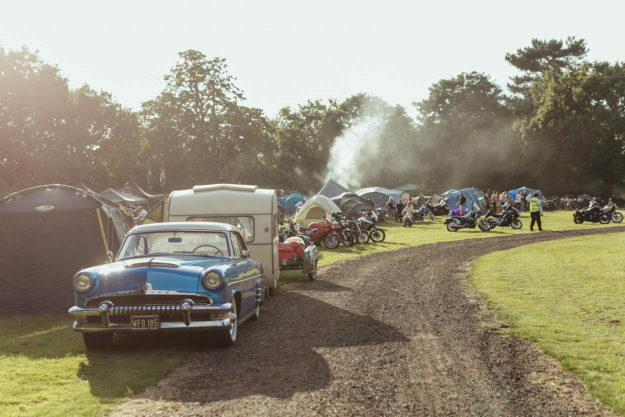 They spent a summer’s day tearing up the lawn aboard homebuilt customs, classics and slightly inappropriate machines in the grounds of an impressive country pile. 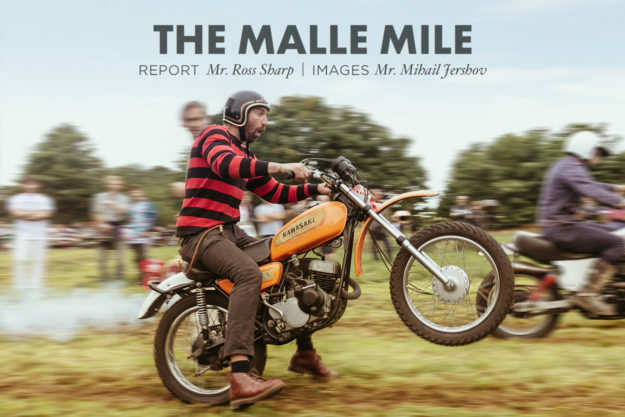 The formula has clearly worked: race places at The Malle Mile now sell out within hours. Social media and word-of-mouth have worked their magic, and attendance has rocketed. 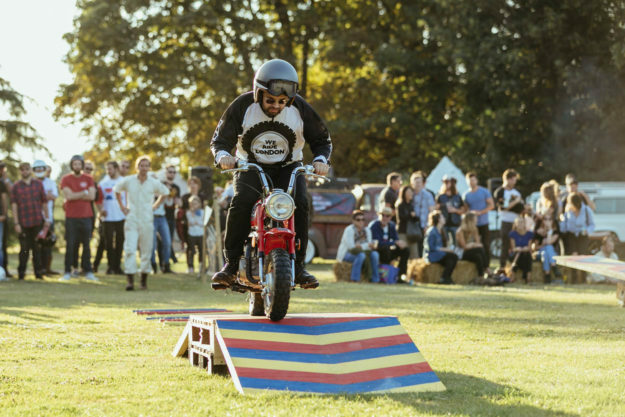 The schedule now includes a twisty hill climb, a mini-bike obstacle course, camping and a legendary after party in a secret room in the bowels of the mansion. It all makes for a belting weekend. For 2017 Robert, Johnny and their bespoke-overall-sporting crew upped the ante. 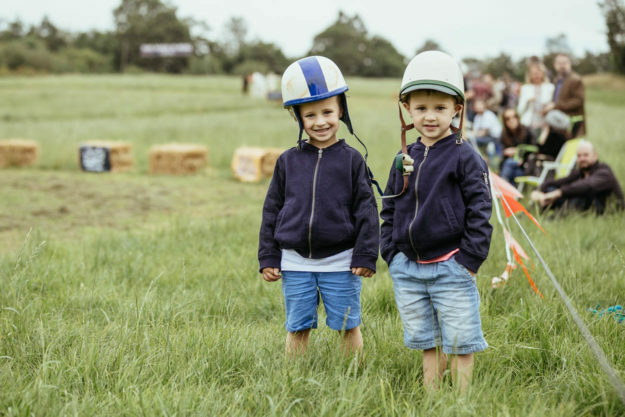 They added a Friday evening cinema night, extra camping, boxing and a Motopolo tournament. 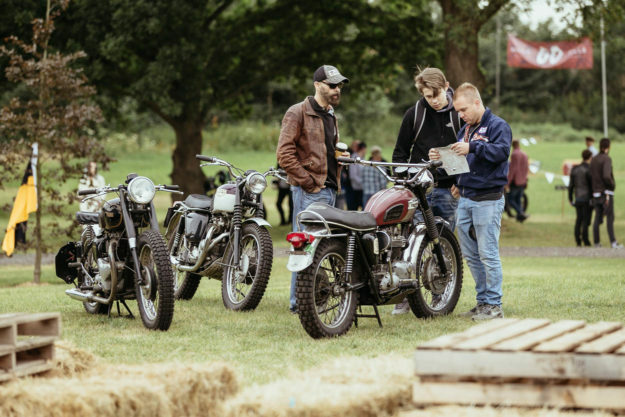 Plus a classic bike display, and a bigger and better party. 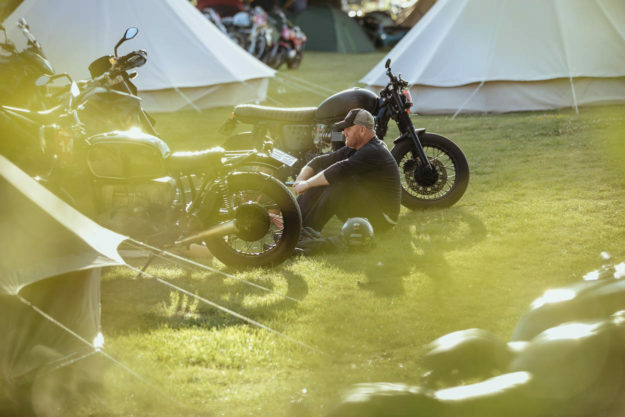 The feel and setting was similar to the early days of Goodwood events, in the late 1990s: an eclectic mix of vehicles and attention-to-detail, a festival of petrolhead nirvana creating an illusory escape from the real world. 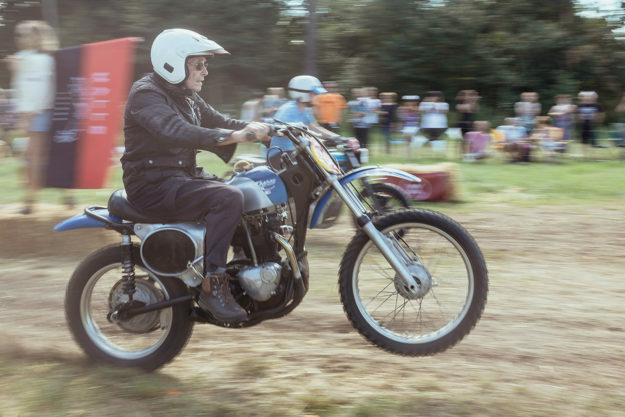 Saturday’s hill climb revealed a course slightly modified from the previous year, with tighter turns to curb the enthusiasm of the near-200 competitors. But that message was lost in the post: racing was close, though remaining gentlemanly. 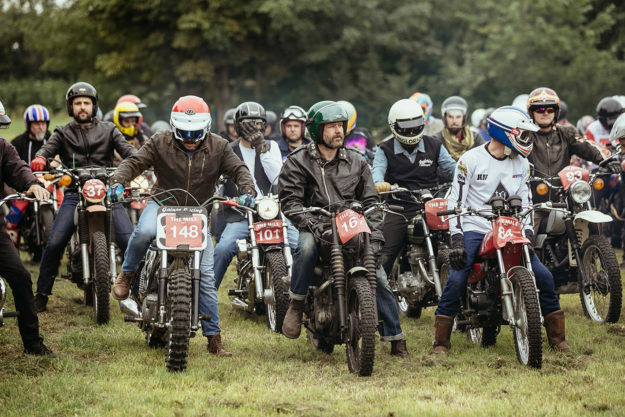 Riders must start with a left hand on their helmet; heats can be won and lost by those with the quickest reactions to pull the clutch in and select the correct gear. 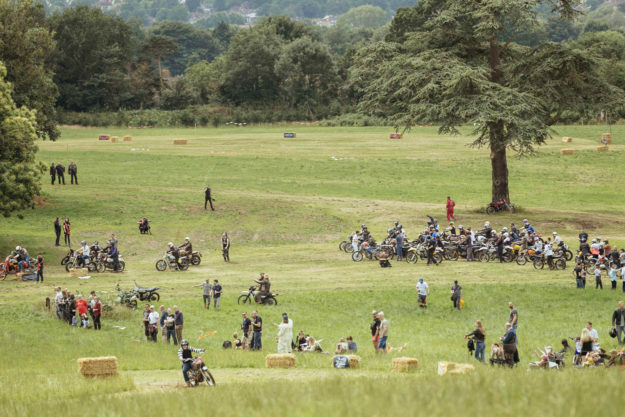 There were clearly some motocross racers amongst the seemingly amateur bunch, as some of the riding was mighty impressive and a pleasure to behold. Particularly from a previous world champ of 87 years who, when helmeted, could have been mistaken for someone a quarter of his age. He not only became one of the people to beat but the choice man to be beaten by. 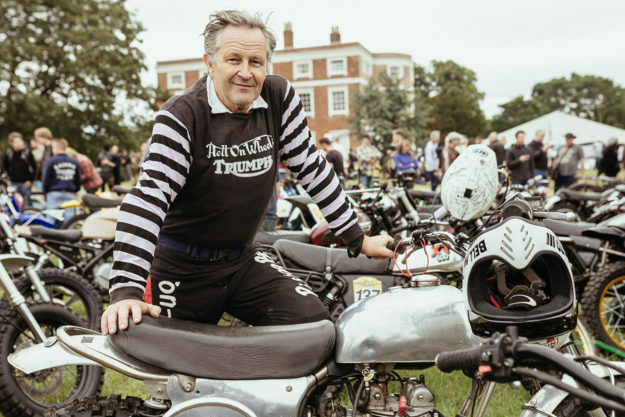 But perhaps the most impressive was motorcycle valeter Freddy Trott, who rodeo’d a road-legal and fat-tired Triumph Bonneville up the course with so much skill it looked like he was on the latest 250cc ‘crosser, not a near-250-kilo pig. The afternoon’s drag racing ran to a similar format, with pairings decided by presumed mechanical equality. Again, reaction times and traction were the ultimate deciding factor. One guy on a knobbly-shod Aprilia Tuono not only made a great noise on open pipes, but also shot a roost of lawn high into the blue summer sky. And what do Brits do after racing and before a party? Boxing of course. A championship-size ring was set up, and after a demonstration between two tough-jawed pros, the ring was opened up to onlookers. Anyone who reckoned they could manage a single three-minute round was invited to have a go. As for the party…well, you had to be there. On Sunday, the sprint race and the Motopolo tournament took place under a glorious summer sun. The Motopolo ball was of course truly artisanal, crafted from a special hide by one of the Malle luggage makers, and ideal for punting around—provided you were riding something light and nimble. The sprint heats were followed by a knockout stage: this was quite a task to organize, considering the volume of eager riders. But slowly the potential champs and wannabe heroes were filtered out, leaving those with knobby tires and/or the reactions of a gunslinger. The clever money was on a multi-cylinder steed taking the win. 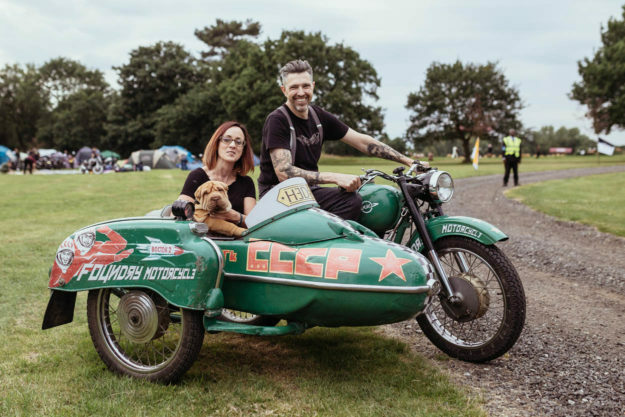 But it was a Zaeta piloted by Lee Kirkpatrick of Krazy Horse Customs that took the top spot. Lee’s prize? 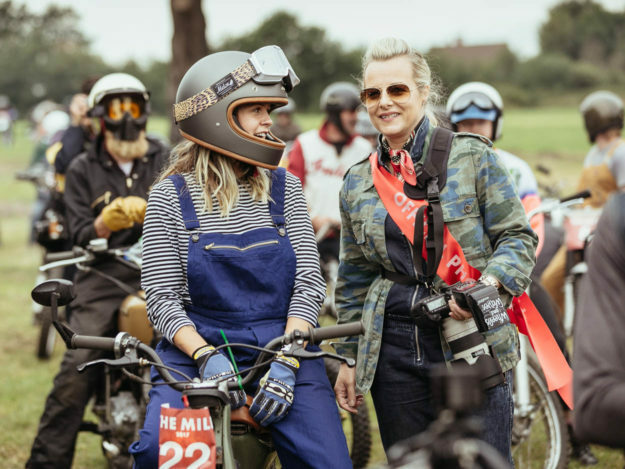 A lap of honor bearing the Malle flag, and a hand-beaten aluminum trophy from deBolex Engineering. Both fine things, but for Lee, it was all about hanging out with his pals, making new ones, and simply having a laugh. Just the tonic for today’s serious and testing world. Perhaps watching racing is becoming a bit old hat, and it’s the taking part that counts?